Galaxy Trailer Special tires are built beefier and stronger than any of the competition. They are made with more plies, allowing higher air pressures, which in turn means greater carrying capacities. 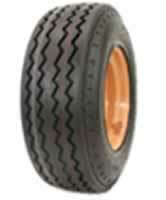 Galaxy Trailer Special tires are built with the best rubber compound and in many sizes, the deepest tread thereby yielding the longest wear. Many of these tires are built with Galaxy's famous Rim Shield Protector to keep the rim from being damaged. "After testing hundreds of Galaxy 8x14.5 tires, we found them to be perfect without any failures whatsoever." - See Product Testimonial for full statement.